With this unique and user-friendly Etch Remover / Marble Polishing product, removing water-stains and spots, glass-rings, dull spots and damage from acid and chemical etching has never been easier! SAVE 15% on the Etch Remover when also purchasing the "Bundle" (see tab on this page above) Etch Remover + Granite & Marble Spray Cleaner. 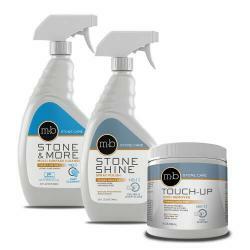 The Marble Repair Kit offers complete care with repair, cleaning, and polishing products. Restore the shine to your polished marble and travertine surfaces with this very popular and effective professional-grade marble polishing & etch repair product. 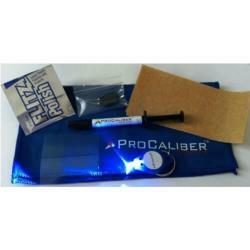 Excellent for light scratch repair as well. NOTE: For use on polished (shiny) surfaces only (marble, travertine, limestone, and onyx). Not for use on honed or other non-polished surfaces (it will make the surface shiny). Will not re-polish granite, quartzite, serpentine (green marble), black marble, or quartz countertops. These stones require the service of a stone restoration professional. TIP: The Etch Remover product must be neutralized and removed from the treated area after and/or in-between applications. We recommend using this Granite & Marble Cleaner for this purpose and for general marble cleaning. Calcite-based stones like marble, travertine, limestone & onyx are sensitive to acidic foods like citrus fruit, fruit juices, wine, coffee, soda, vinegar and to alkaline cleaning products like bleach and nearly all typical household cleaning products found at your local store. Such substances cause "acid etching" or "chemical etching". The acids and chemicals can corrode or "etch" the surface creating dull spots, clear or light-colored spots and glass-rings. These are not stains in the traditional sense. Nothing is absorbed into the stone, so etching is not related to sealing. Etching is actual physical damage that removes the polished (shiny) layer and eats into the stone. A stone sealer will not prevent etching. The original shiny polish on your marble countertops and floors was created by friction and abrasion. The Etch Remover / Marble Polishing Product works in the same fashion restoring the shine and color to surfaces damaged from etching by polishing marble surfaces. The process is similar to sanding wood smooth. Best of all.... it's an easy DIY project saving you the costly expense of hiring a pro in most cases. Marble repair and maintenance made easy! Although rare, very severe etching that is rough to the touch may still require professional attention. NOTE: Etch Remover / Marble Polishing Product is not to be confused with Topical Stone Polish. The Topical Polish / Conditioner is a "shine enhancer" which can only enhance undamaged surfaces. It cannot remove glass-rings or repair etching damage. I had several etch marks on my Marble countertop. I had one estimate of 250.00 to repair. I saw you’re website and thought that for 29.99 I’d give this product a try first. It arrived Wednesday and with just a little elbow grease, the etched areas disappeared! I wanted to write a review to add to all the others. This stuff is great! I am so happy to have found this product! I tried everything to remove vinegar spill on my Carrara marble floor. I tried to make my own poultice but nothing works. When I tried the etch remover, it absolutely works! 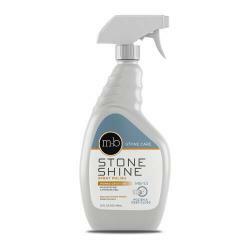 I recently used your stone care products and am exceptionally happy with the performance. I had cup rings left from wine glasses in a marble table top that I could not remove. My attempts to remove the rings only made it look worse. I read the reviews on your stone polish (Etch Remover) and thought I would give it a try. To my amazement, with very little effort using the Etch Remover, the rings completely disappeared and our marble table top looks like it just came off the showroom floor! I highly recommend this product, as it is truly amazing! Product for my marble countertop worked fabulous. Vinegar etched and now back. Thank you!! I have just used some of your products- the polishing compound and marble floor cleaner. They seem to have worked well. The issue is a bath floor which has become etched and dull.It is not damaged , just dull. I made up the paste material and tried a small area by hand and then with a slow speed circular hand buffer. I must say after only about a minute with the buffer and a followup with the marble cleaner there is a very good reflective gloss. I will continue to use this over the next 2 weeks to finish the floor. I am pleased so far. After cleaning the shower with CLR, I inadvertently set the wet bottle down on the marble counter in the bathroom. It sat there for some time and when I finally moved it, I noticed a giant cloudy spot on the counter. The CLR has eaten through the top layer of the marble. I feared it was permanently damaged, or at the minimum, would require professional repair. I found this product online and figured I had little to lose. After just one application, the cloudy spot was nearly gone. After a second application, it was like it never happened. In fact, the treated area looked so good and so shiny that I decided to treat the entire countertop. Looks like brand new. I was very happy with the polishing powder. It actually worked-unlike so many products that claim they do but don't. My long-haired cat has many hairballs and vomits onto the marble floors. The acid in the vomit immediately ruins the shine and no amount of cleaner, lotion or cream has ever worked. At last, a formula and method that if applied correctly actually restores the mirror-like sheen. I have many areas to do still, as well as the marble in the bathroom, especially around the toilet area. Short of hiring a professional-this product is it!!! Arrived and worked like a charm on a marble saddle that had been etched with vinegar. Two go overs and it looked like new. Thank you. I received the Stone Care Etch Remover and was happy to see that it actually worked!! I have 3 months new Crema Marfil Marble kitchen countertops and my son knocked over a full glass of vinegar. So we have a spill spot and splash over the entire surface. I tried a test on about 4" x 4" of the etched spot and your product worked great. I have tried using different products in the last few years to fix a glass ring that has long agitated me with no results. After reading some of the reviews I have to admit that I was skeptical of this product too, so I initially tried it under the counter to see if there was anything I should be concerned about. Nothing bad happened, so I dug in and worked on the glass ring. It looked like it initially did some good, so I went after another spot right by the sink where I spilled vinegar and didn't clean it up very timely. The vinegar spot cleaned up with some rubbing, so I went back and worked the glass ring. I was very impressed with the results. I have a very dark granite so you can seriously see etching in light reflections and both spots cleaned up very well. Also, we built a new house six years ago and I was disappointed to see what looked like a scratch mark about 8-10 inches long at one end of the center aisle. It couldn't really be considered a scratch either, more like the polish was scrapped off in a squiggly line. I complained to the home builder and he sent someone out from the place they purchase the granite from. He worked on it for about an hour with a piece of wax and cotton cloth. He was able to minimize the problem, but I knew it was still there and could see it when standing in the right light. I couldn't help myself, I put this product on the scuff. It took considerable rubbing and buffing, but you can barely see it now. What little is now visible just looks like a natural part of the stone. VERY IMPRESSED!!! My husband (who notices nothing) was too. I would definitely recommend this product. It's not a product that can simply be wiped off, you have to be willing to rub and buff until the film/residue is gone. I have to write you and let you know the product I purchased from you to erase some dull areas on my marble worked SUPER. It looks like new. I am amazed how well it worked. AND it was easy. Thank you for saving my end table. This product is fabulous! Something had been spilled on a beautiful polished marble floor that left dull spots -- I was sick. With very little effort this product restored the shine beautifully! I had made a stupid mistake and sprayed CLR Kitchen and Bath cleaner on my recently installed marble bathroom floor. Needless to say, it left marks and I thought we'd have to take up tiles and replace them. Fortunately for me, I came across this website and found the Marble Polishing Etch Remover. I ordered a jar and 2 days later it arrived. I barely got it out of the box before I was running upstairs to try it on my pitiful looking floor. I was overjoyed to find it worked as advertised!! It took the ugly marks off my floor and polished the tile back to its original shine. I am so thankful!! This product is terrific!! No more harsh cleaners for my marble bathroom! I clean all of my floors with boiled water and vinegar. Totally forgetting that I could not use this on my brand new travertine bathroom floors, I put the water mixture from my shower to the door, leaving etch marks all over the place. I researched and went to all my local stores, including Home Depot, and was told its a lost cause because travertine was so porous and the water probably went very deep. I resolved myself to having a professional come and polish it out for $800. I found your product online with great reviews and decided to take a chance on it, as this was a less expensive alternative. I am HAPPY to report that not only is ALL the etching gone, but it has restored it back to the natural shine. Thank you so much for this amazing product. Not only did this product not remove an etch mark from my counter, but it made it look significantly worse by removing the "shine"/finish from the polished marble. It looks like a complete mess now and will need professional repair. ++++ COUNTERTOP SPECIALTY COMMENT: Ashely we certainly apologize for any trouble you're having using the product. Know we are always here to help. Simply contact us and we will give all guidance needed. What you describe is 100% normal and how the product works... except that you stopped too soon. The product must be applied in repeated small applications until the shine is restored. The key word is "until". If you stop in the middle, you'll see exactly what you describe. This may seem like nonsense, but it is how the process of restoring marble works. Note that you aren't actually "removing" the spot but rather re-polishing it to make the dull spot shiny. It's a process that can take repeated applications. A pro will do the same thing only charge you 10X more for it. I wanted to use marble as I just didn't like the look of anything else. I was resigned to spend $800-$1000 every couple of years to keep it looking the way it should. I tried a few polishing products just in case I could avoid the expense, but no luck. Fortunately I found this powder by accident and decided to risk one more attempt. It seemed a little pricey, but it turned out to be the best return on investment I've made in the entire remodel! I was skeptical but ordered anyway. I have 3 bathroom countertops of Marlique, a marble composite material. They had etchings and rings all over them and was going to have to replace them. The product removed all the stains and they look brand new. Well worth the money! I would give 5 stars except for the price! ++++ Countertop Specialty comment ++++ Thanks for your feedback Karen. Great to hear that it worked on your man-made marble composite countertop. Often etching on such surfaces is not repairable even with our professional-grade product. And your input on price is appreciated as well, although, please note that professional restoration is 5-10X more expensive. Thanks again! We tried the Polishing Powder on a small counter and it works great! Easy to apply and the marble looks like new. I used this as instructed for an etch mark made my lemon juice on polished marble... all it did was make the etch area larger! I would NOT recommend. +++ COUNTERTOP SPECIALTY COMMENT +++ We certainly apologize you did not get the result expected. However, please know that what you describe is 100% normal and how the product works... except that you did not complete the process and you spread the product around on too wide an area. The product must be applied in repeated small applications until the shine is restored. If you stop in the middle, you'll see exactly what you describe. And note that this is not a "wipe on, wipe off" product. Also, the etch mark is not being "removed" as a stain would be. The surface finish itself has been physically damaged and this product restores that finish by re-polishing it to a shine. It's like sanding wood. If you sand just a little, all you will do is rough up the surface. You may even see the scratches from the sandpaper. But continue sanding, sanding, sanding and eventually, the wood will look and feel super smooth. The same process applies here. There are no set number of applications needed. Simply make repeated applications until the shine is restored. The number of applications needed varies depending on the severity and size of the mark and, in some cases, on the particular marble color. Some may repair an etch mark in only one or two applications. Others may need 5 or 6. If you read the reviews, you'll see a few others that have made the same error. Please know we are always here to answer any questions you have and provide all necessary guidance on choosing and using products. We sincerely aim to help you solve your stone care issues and not just sell a product. This product saved my brand new marble vanity top. Mistakenly, and I learned a valuable lesson, after installation I used a common cleaning product and was in tears to see the marks it left. Nothing worked to fix it. I scoured the Internet frantically and found your website. You taught me how to pinpoint the exact damage, etching, which led to me choosing the proper product to correct it. I was hopeful but the damage appeared impossible to fix. Within minutes upon receiving Stone Care Marble Polishing Powder my marble vanity top was beautiful and completely etch free. I was so thankful and have become so cautious I immediately ordered the GREEN CERTIFIED NATURAL STONE & ALL SURFACES DAILY CLEANER & THE TOPICAL STONE POLISH. Both leave my marble better than ever. Since we just remodeled our master bath I will be referring Countertop Specialty for all my stone cleaning products. Thank you for saving me. I had dull spots on my travertine tile floor from both vinegar and wine. I got the marble repair kit, followed the directions, and it worked perfectly - all the dull spots are gone! I had thought I would just have to live with them! Product, service, and results were amazing. Very pleased with the warm service for an on-line order. The product worked as advertised and would highly recommend. We completed a full home renovation in 2015 and chose a stunning polished Striato Olympico (gray/white striped) marble for the large kitchen island. We didn't realize the ultra sensitive nature of this marble and after hosting 13 people for Christmas, it was "ruined" with rings from bottles/drinks etc... which left dull etchings/marks. In the past, we hired a stone contractor to polish the marble to remove such rings/etchings/marks. We paid $400 just to polish a small vanity countertop. After scouring the Internet for a DIY solution, I decided to give this a try. I rarely provide reviews but wanted to share my experience with this miraculous product. It removed all the rings/etchings and the marble is back to a beautiful and FLAWLESS polish. I looked all over for a product that would remove the etchings on our marble counter tops. Fortunately I found the Stone Care etch remover. It works great. I purchased the marble etching powder for my counter tops and was very impressed at how well it worked. Better than advertised! Hello, I just finished using my new etching product along with the stone care product on my travertine table. The results were amazing...so so happy. Thanks for your help! I spilled a bunch of lemon juice on my marble countertop. It was hideous. Thank goodness for the MB-11 powder and MB-5 cleaning spray. They are the best $50 I ever spent on my house. I am very happy with my purchase. I used the marble repair rub and was able to buff out the etch marks on my marble countertop in my bathroom. Thanks. This product was used on a 2x2 marble medallion and after 10 cleanings it did not improve the condition of the marble at all. A total waste of money. Called a professional and the medallion now looks like new. Would not recommend or buy it again. ############## Countertop Specialty comment #### We certainly regret that you were unable to achieve the desired results. We encourage you and all customers to simply contact us with any questions at any time. We are happy to provide all help necessary regarding proper product choice and use. We will always assist you to achieve the desired results. The Etch Remover is not a "cleaner". 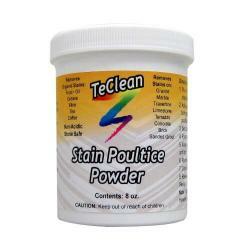 This product restores the polish on etch marks from chemical damage. If the Etch Remover was applied 10 times with no change, then the marble was not etched and this product would not have any effect on any other issues like grime, grease or stains. Various care & repair issues can occur with marble each requiring a different product and correct diagnosis to resolve. I purchased the marble etching powder for my countertops and was very impressed at how well it worked. I was planning to have my countertops repolished but now I do not have to do that, and saved myself quite a bit of money. I would recommend this product to anyone. Thank you very much. I am just writing to let you know that the Marble Polish product that I just recently purchased is fantastic. It is easy to use and leaves my marble table top so shiny and clean. I had a stain on the table that left it looking dull and the spot was very noticeable no matter how much I cleaned it. With one application of this Marble polish the stain was gone and the table is shiny as the day I bought it. Fantastic product. It was easy to order and was delivered in a timely fashion. Thank you so much for this product. WOW, this stuff really does work! I'd used an acidic cleaner on my brand-new marble vanity top, which left ugly etch marks that a refinisher said would cost $150 to fix. But I used this product, and the marbles looks brand-new, no etch marks at all. The product was good enough to get my etching from the lemon juice that stayed on the marble over night. There is more work to it than I originally thougt but that is not say it doesn't work. My issue now is that the marble veins and grey areas feel higher than mostly white areas, whick bothers me, (but of course not as much as the etching did).so I am wondering is there a way to level out the smoothness of the marble between the veins and the rest of the marble. I purchased the Stone Care Pro: ETCH REMOVER / Marble Polishing Paste because we just had marble counters installed. 2 weeks after we got them, my husband spilled lime juice! I was so upset and did tons and TONS of research on how to remove the etching. This product is AMAZING. The very first time I used it, I was really worried because it seem to make the etching worse. However - it takes A LOT of scrubbing and just little amounts at a time. After about three times of going through the process (FOLLOW DIRECTIONS EXACTLY and use a little at a time! ), the etching was completely gone. 100% completely gone. It is amazing! And that spot actually looks better than any other area on my counters! It is remarkable. I would highly recommend - even if you don't have etching, you will eventually and it is awesome to have on hand. Knowing that this product works so well makes me much less anxious about people using my counters ;). Which is a win win for everyone!! I had great results after just one application of the etch remover paste on the travertine counter and floor in our master bathroom. I have also done several applications of the product on the travertine in our shower and am starting to see some results. The following is my observation only, I could be making erroneous assumptions. I have a side board with a dark, almost black marble top that the previous owner used as a wine serving platform and she REALLY liked her wine. There were many rings from the bottom of glasses and a lot of splatter spots. In the end it looks quite nice and unless you are really looking it is as good as new. The few remaining areas are from glass rings that started a few inches in diameter and about a quarter of an inch or more thick. It seems they were left without cleaning and after half an hour I had a barely noticeable ring about 1/64th thick but again, if you aren't looking in the right light you can't see it. The spots from splatters varied but a single spot might take two to three minutes to polish to oblivion or for an area with many a 10" x 10" area might take 30 minutes to make them all go away. It seems that the polish has a variable abrasive property so that as you start rubbing it is course but as you work it over time it becomes a fine, almost creamy polish. I thought the cost was a little high but I can't argue with the end result. I am new to marble and no one besides me will ever notice there was anything wrong with the piece as bad as it was. +++++++++++ Countertop Specialty comment +++++ Thanks for you comments! Etch mark severity will vary. Thus, the number of applications and time to repair will vary for each mark as well. However, it works like sanding wood. Continue making repeated applications UNTIL you achieve the level of shine desired. The product may seem expensive compared to a regular "cleaner", however, it is super-cheap compared to professional re-polishing, which is your only other option. And a single jar will last quite a while. Thank you so much for having the marble etch remover. It worked great and was extremely quick and easy to use on our calacatta gold countertops! This marble polish is amazing it works Great!! My marble table look like new. I just wanted to tell you how amazing your product is. We had just installed a new vanity with a marble top and the plumber put something on the polished surface that caused a dull area about 8 inches in diameter. 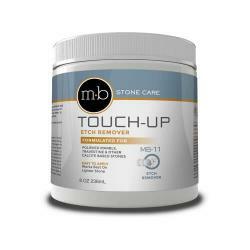 We got Etch Remover and Stone Care Cleaner and with some great tips from Ryan the top looks brand new. Saved the $400 cost to replace the top. Fantastic product!! This was the best product I found. After etching a marble floor with the use of vinegar, I applied the product and followed the instructions on removing etching. It was fantastic. It was a reasonably large area, and I could have used another bottle as I was covering the entire floor. It removed the etching and polished to a high shine. Thank you for the help. This product did not work to my expectations, doesn't work on polished marble etch marks. ++++++++++ ADMIN REPLY: Hi Ron, we're certainly sorry it didn't work as you expected it to. Please know we are ready to provide any and all guidance needed to ensure you are able to achieve the desired results. Just need to ask.=== The product does absolutely work to restore etch damage on polished marble. Stone restoration professionals world wide have been using this product successfully for many years.... along with thousands of homeowners. === The most common issue we see is customers expecting the product to simply wipe on and wipe off and giving up too soon. If used in this manner, it will seem like the product doesn't "work". However, several small applications must be made... and the key is... to do so until the shine is restored. Just have to keep at it... and it will work perfectly. Cheers! Vinegar left fairly deep etch spots in our marble countertop. The etch remover worked great with little effort, spots are gone! Great product. I just received the marble etch remover. I had dropped a gallon of pineapple juice from the top of the staircase in my foyer, and even though I cleaned it up immediately, there was a big splatter etched in my brand new marble floor. After trying everything else I could find I was about to hire a professional, when I saw your product. It did take a bit of elbow grease, but it did work!!!! It's a great product! Thank you so much. Best $25 I ever spent. I ordered the Stone Care: ETCH REMOVER/ Marble Polishing powder. I was amazed at how easy it worked to remove the chemical etching on my marble floor. It was worth every dollar I spent. I highly recommend this product. Just wanted to thank you for your very prompt and courteous service. The product worked as advertised. Since I have had a marble floor in a guest bath for over 20 years with little etching or problems I installed a Carrara marble countertop in our master bath. I was having some floor repair done and the workers laid a bag that had a petroleum based product that had spilled in the bottom of it on the counter. It seeped over several hours onto the marble creating at least a 1 foot round intensely dark stain. I tired poultices and was able to draw about 90% of the stain up. Not being able to leave well enough alone I made a bleach poultice with paper towels and let it sit for 24 hours. It pulled up the last bit of stain but it also etched the marble so badly that you could see every paper towel design on the marble. I used the etch remover and it worked and removed the etching. I applied it, checked to see if the etching was gone and when it wasn't reapplied it for a total of about 3 times. Yes it took a little elbow grease, but not much. All that is left is a light impression of the paper towel in a few areas, and you can only see it if the light is right and you know where to look. From my perspective the etch remover was easy to use and an amazing product. It left the marble with a gorgeous shine. I have Carrera Marble tops in my kitchen (sealed when installed) however they are very sensitive to anything that spills (I was aware when installed, but loved the look). However, the Carrera is much more sensative to etching and marking than anticipated. Got some outrageous quotes to have polished and sealed. So, did some searching and found Countertop Specialty on line. 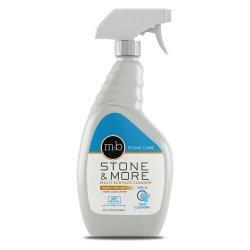 Ordered: Stone Care Granite & Marble Cleaning Spray plus the ETCH REMOVER / Marble Polishing product. Expected the worst and hoped for the best. Followed the instructions - worked amazingly well. It does take some "elbow grease" but nothing an ordinary person cannot handle. The product works, simple to use.. and great results. (I consider the Carrera Marble one of the most challenging tasks for the product). Thank you very much. I used the Etch Remover last night. Its amazing! I've tried everything for etched marble and this is the only thing that works. It's just fantastic. Do a small area at a time. This is an AWESOME product!! I bought a vanity with an engineered marble top and within a month of installation, I noticed the top was getting badly etched. After investigating different bathroom products, I realized that my housekeeper was using vinegar to clean the vanity top and this was causing the problem. I tried EVERYTHING I could think of to remove the etching and NOTHING worked until I read about your product on the web and gave it a try. Within a few minutes of making a paste of your product and rubbing the worse spot 30 or 40 times, it was gone! The sink was like new again in that spot and then I just repeated the procedure in the other 5 spots with a perfect finish for those too! I cannot thank you enough for this great etch remover product! I just want to say how happy I am with this product! I was skeptical but desperate! Lots of elbow grease needed but so worth it. We had spots on our floor and one on the countertop from corrosive toilet cleaner (We have since gone green) and I your product worked like a charm, Thank you! Wonderful product. My counter top was cloudy and stained and this product brought it back to its beautiful luster and shine. This product really works. We had horrible water stains and some other type of waxy haze on our countertops, this product totally works!!! I'm so pleased, I will keep ordering this product! This stuff is WONDERFUL. Used the wrong cleaner on the marble in the master bath and ruined it. Used this product AS DIRECTED (with lots of elbow grease!) and it worked perfectly. Now I have to go do the countertop in the guest bathroom because it doesn't look as good as the one in the master. Thanks for the perfect solution. Would give it 6 stars of possible. It works. I used it on my onyx counter where I had set down a bottle of harsh bathroom cleaner that left a ring. Unfortunately the texture of the stone was altered by the chemicals, which the Etch Remover could not fix, but it did restore the shine, so the ring is much less noticeable. THANK YOU for making a product that actually does what you say it will do! We ordered the marble etch remover for our bathroom marble counter top and it worked better than any other product we have tried in the past. The etches have completely disappeared and the counter top looks like new! I am now looking forward to trying products for the kitchen! I am on bottle number two and only because the tile guy who I had come in and polish my 'mistake' thought the product was great and I ordered him a bottle. Yes, this does take a lot of elbow grease -- so not sure if you can actually restore the shine by hand, but with a soft buffing pad and some patience it does work and it works great! ==== Admin Comment: Yes, there will be some variation regarding how quick/easy the restoration is due to severity of etching and/or the differences in the stone characteristics. Some will only require a single light rubbing... others multiple vigorous applications. Glad it's worked so well for you! I Have no idea how most of these reviews are so wonderful. I ordered some of this and was so terribly disappointed. I feel like I just threw my money away..... Would NEVER tell anyone to purchase this product! ==== Admin Comment: Hi Donna, Thanks for your feedback. We're sorry you didn't achieve the results hoped for. ---Please know we are here to answer any question before or after purchase to diagnose the problem, advise on product purchase and correct product use. ---- We did attempt to contact you to provide assistance and solve the issue. ---This product absolutely will restore etching on marble, however, it must be applied correctly and for the correct problem. It is common for people to confuse etching with staining (this product will not remove stains). ---And the most common error is simply not applying the product sufficiently. The paste must be rubbed on the etch mark until the shine is restored, which means several applications and vigorous rubbing may be necessary in some cases.--- Please contact us and we'll provide all necessary help and solutions. This product ROCKS! I made a huge mistake by using CLR on my marble tile. I removed it as soon as I saw what it was doing but of course it was too late. Long story short -- this stuff is amazing!! I did one application and the shine has been restored. I can faintly still see a line where the damage was so I plan on doing another application tomorrow but even if it doesn't get any better I am very happy with the outcome. Thank you so much!!! After trying several polishing products unsuccessfully I tried this one and it worked miracles. I thought it was not going to be able to remove the water marks of my marble counter top. This product did it no time. I used a drill and a buffer disc to apply the product. Thank you very much for a wonderful product and your very complete instructions ! -----After much hesitation and skepticism, we finally tried the paste on our marble this past weekend, and were truly amazed of how well the damaged tiles were restored. -----I admit that on initially applying the paste, I became a little panicky when it got smeared to the undamaged surrounding area and caused new hazy edges, but we soon realized that with reapplication of the paste, and quick rubbing and wipe off with a clean cloth, the residue can be easily removed. ----We are quite happy that most of the original dull spots now were no longer noticeable. ----Again, thank you for a simple magic product that saves us lots of agony and costly repair. ----I already highly recommended your product to some of my best friends. ----You've earned our trust, and I definitely will consider other products in your portfolio when we have a need in the future. I bought this polish to help restore shine to my marble bathroom vanity where there was a dull spot. The product not only did not restore the shine but it dulled the surrounding area where it came into contact with the surface too! So now I have a much bigger dull spot! Then, inspect and repeat again using small amounts of paste in short sessions until you have restored the color and shine. --- It will work! ----- And please contact us at any time for advice and instruction on correct, effective use of products. This product was amazing! Unfortunately I had a sick child in the bathroom whose vomit left some horrible etch marks. Visions of professionals ripping up my tile or other professional work was swirling through my head. You would never know I ever had any damage. The area is completely back to its shiny old self. Unbelievable! I have since bought other products and am equally impressed. We just had 3 of our bathrooms remodeled the 1/2 bath on the first floor has a marble vanity counter. It had water spots on it that my wife could not remove. I decided that vinegar would get rid of that and it did and in the process it also did a great job of etching the marble. Wife NOT happy. Came across this site and I am so glad I did. I buy a lot of stuff online and try to rely on the reviews of the products. Sometimes they are reliable. I say sometimes because if you rely on product reviews for dog allergies, don't believe any of them. I have yet to find one that works! Anyway, I read the reviews here and I can say with great confidence that they are very accurate. I used this polishing powder and it worked wonders. Like others have mentioned it does take a bit of elbow grease, but in the end our marble vanity looks actually better than new. =========== For those that gave this product a bad review, you have to keep rubbing repeatedly and put some pressure behind it. You just don't put it on like a car polish, you have to keep rubbing. In the end you will be amazed. I also ordered the 3 pack counter top kit and used the cleaner after the etch remover and then the polish and double WOW. I used most of the polishing powder and will probably reorder more as a "just in case" I need it again. I will also be ordering more of the cleaner and polish as well. Haven't tried the sealer yet but I feel very confident that it will work as good as the other products. Great company, great products and good service!!! AWESOME! Months ago I installed polished marble throughout my home. During the summer I had loads of guests and noticed etching in various places. I tried several products without any success. I thought I was going to have to live with this. However, I found this product, and the results were instant and the spots removed and the floor back to normal. I feel lucky to have found this product. I was suspicious about the claims concerning this product, but the suspicions were unfounded. Although not all of the etching disappeared, our marble counter now is so polished it glows. We had to have our marble kitchen countertops mechanically polished due to water etch rings. The installer tried everything and was unsuccessful in removing the rings. After the polish we wanted to see how to remove etch rings in the future - so we tried this product. It works great. Sometimes you need to use it more than once on the same etch mark but it eventually removes the etch. Much cheaper and safer than a $550 polish that takes all day and leaves a ton of dust. Product did NOT perform up to my expectations. Did not remove many of the etchings. All in all, I was Not satisfied.====ADMIN COMMENT: We are sorry you are not satisfied. All etch marks are the same except for degree of severity, so the product will restore the other etch marks. In the very rare instance you have severe etching (rough to the touch) then you'll need to hire a professional to restore the finish. Marble requires different techniques at various points in the process and this product will not be sufficient for severe etching. But again, very rare, so the product will restore all the etch marks you have... not just some of them. The most common mistake is not working the product long enough or failing to make sufficient applications. You are not actually "removing" the etch mark from the surface, but rather "restoring" the polish/shine to the marble. It's like sanding wood... you simply have to do it until the marble is shiny again. We are happy to provide any guidance you may need. FANTASTIC product! About 15 years ago, I had a white marble table made in Italy... innumerable meals and several moves later, the entire surface had developed "character" with etching/scratches. I had been meaning to call a professional stone worker over to have it refinished, but kept putting it off. THEN I ran across this product and am simply amazed at how wonderfully it works! The table looks fantastic! Follow the directions and be patient/persistent... as with all shiny surfaces, this takes time and elbow grease... but the results are worth it! Thanks! I was skeptical, but this worked great on dullness resulting from cat vomit and soda spillage. Nothing else I tried had any effect. Exellent product. I had my doubts, but followed the directions and the marble countertop in my bathroom has its shine back. I was delighted and product was delivered promptly without a hassle. Where do I start? First off, these items were delivered to my doorstep two days after I placed my order. I used the marble cleaning spray first, as recommended, and oh wow - it smells like yummy chocolate! Then, I applied the etch remover in a circular motion, adding a little water to the solution as directed. At first, I didn't see results and thought the product wasn't working. However, as I continued to buff my marble sink, I could see the luster and shine returning to the areas that were etched from a harsh bathroom cleaner I accidentally used. You will see the shine come back as you continue to work the product into the marble. I've only done one application and my marble counter looks gorgeous. The parts that weren't etched shine brilliantly and look saturated with finish and the parts that were etched are coming back to their full luster. I can't WAIT to do another application because I know that within a few times, the etching will be completely unnoticeable. I even followed the surface with the light to see where it dulled and it was much less obvious. What a wonderful (and great smelling) product that I will surely give as a treat to my marble going forward. I will be recommending this product to anyone I know who has marble surfaces. One unfortunate side note - the product did not remove a ring stain on the surface, but given how much else it did remove, I'm highly satisfied. ==== ADMIN COMMENT ===: The ring was likely a stain as you stated, which is a completely different issue than etching requiring a different procedure/product. Thanks for the feedback! Fantastic! This product really, really works removing rings and spots from marble table top and also marble bathroom countertop. This product worked great. It was easy to use. It took me about 15minutes of polishing to get rid of a big dull spot and a few etch marks on my vanity countertop. Thank you for great product! We purchased a home with marble counters in the kitchen. Needless to say the where etched all over. This product worked well... it does take awhile and persistence but it saved on having to call a professional. We used a buffing tool which helped with time. I recently ordered the etch removing product after a leaky bowl of bruschetta was left on my brand new marble countertops. It worked great. I called customer servive for some pointers and they were very friendly and helpful. Thanks again! Exceeded my expectations. I used the Stone Care Pro marble polishing paste, cleaner and sealer products. Our marble bath vanity was basically ruined with hard water stains and deposits from other failed cleaning and polishing products. 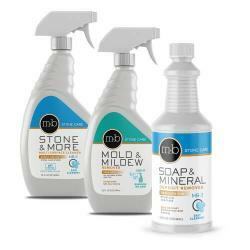 After using many other products (and having a marble/stone care specialist recommend that we just have it replaced) -- these products have worked amazingly well. Looks brand new now. We recommended it to everyone in our building. This product works great! I was told by professionals that spots on a marble floor caused by Lysol bathroom cleaner would be impossible to get out. With a little elbow grease, this product proved them wrong and saved the floor, and it looks even better than it did before! This product saved my marble countertop! I love the polish. I can not believe the dull spots are gone! MARBLE POLISHING PASTE/Etch Remover made my marble countertop look like new. It made the water spots disappear. It also worked wonders of my marble floors. Thank you so much! unabelieveable, fixed lime stains and water rings on polished statuary marble countertops. they look brand new. saved me from having to have them repolished. still can't believe it!! The product didn't work for me at all. If anything, the spots look worse than before I used it. I feel as if I flushed money down the drain. ===Admin Comment: The most common mistake is not working the paste long enough, which may result in seemingly no change or poor results. Restoring the shine is a process of rubbing the paste on the etch mark until it is shiny again. And we are happy to provide advice/assistance if contacted. Fantastic products! We were very doubtful about the testimonials and claims, especially regarding the paste, but we were desperate - we are extremely pleased! This paste restored the shine to my crema marfil vanity top. The etching was very prominent before application but is not so noticeable after just one application. I can imagine it will get better if I apply it 1-2 more times, as advised in the directions. It is well worth the cost. And customer service was quick and very friendly. I would recommend this product to a friend and would buy again. Your product is fabulous. It made my tub surround gleen. The sparkle is amazing. Just a little dab and some gentle rubbing was enough to get off the stains and grime. I thought I had ruined my brand new marble countertop on my bathroom vanity. I unknowingly cleaned it with a Lysol bathroom cleaner which left the marble spotted with dull areas and it took away the overall luster. I was surprised at how well your product actually worked. Not only are the spots gone, the whole countertop is actually shinier than when it was new!! There is a lot of buffing involved but well worth it. I give this a big thumbs up!! I used the marble polishing paste on an antique table top that was very etched with a large etched ring on it and was amazed how well it turned out. It gave it a high polish again. I will recommend the product to my local stone suppliers. Many thanks. I renovated our guest bathroom 6 months ago with Crema Marfil marble. My wife tried cleaning recently with her favorite vinegar/water mixture she uses on the wood floors...and etched the heck out of it! I received multiple estimates of several hundred dollars to professionally repolish the floors. After researching on the web, I found this stuff and figured I had nothing to lose but $24.99. I got today, used a lot of elbow grease, and have restored 90-95% of the shine after 1 application. Buy this stuff...it WORKS!!! Finally, a product that does what it says it will do! Stone Care Marble Polishing Paste will save me the big bucks I pay professionals to remove etchings. THANK YOU! The product worked just as advertised.....Our dinette table had multiple water spots and rings all over it. We had tried to clean it up with ammonia, mineral spirits, and just elbow grease to no avail. After applying this product (and also adding a sufficient amount of elbow grease) the water spots are gone and the table looks like new again. Thanks for making a product that actually performs as advertised!! This product saved my $5000 Sarineen designer table. My kids had left two grapes and put a book on top of them. I did not discover this until 2 days later. I tried to clean it and made it worse by scratching the surface. I was in tears and mad every time I walked by my beautiful table, now ruined. This product was miraculous. You have to try it to believe it. I am absolutely sold. Thank you for a $24 fix to a very expensive table. Dear Hubby in his eagerness to help with the honey dos cleaned up a mess on our marble floor with Mr. Clean. Well, with a little elbow grease and Stone Care Marble Polishing Powder the floors never looked so good. One problem...It did such a surpurb job now I will have to clean the rest of the floors also. What a grout cleaner also! Easy as pie to use. Buy Stone Care: Granite and Marble Cleaning Spray (1 QT) and get Stone Care: ETCH REMOVER / Marble Polishing Powder at an additional 15% off our everyday low price. Using the Etch Remover / Marble Polishing product is very simple and effective, although, different than a "cleaner". It isn't a wipe on, wipe off procedure. The powder is re-polishing the damaged area and must be rubbed on the etch mark until it is restored. However, this is not done in one long application. It's best to make several small/short applications using a new spoonful of powder each time until the shine and color are restored. The most common mistake is stopping before the process is complete. The process is like sanding wood. The surface will get smoother and smoother with each application. Continue with repeat applications until the shine is restored. 9. Repeat this process as many times as needed until you restore the shine and blend with the rest of the surface. The Etch Remover is meant to be applied by hand in small sections. A power tool with buffing pad may be used, however, with caution or you risk burning swirl marks into the marble. It is best to apply by hand. If you choose to use a power buffer be sure to use minimal pressure, set the speed (RPM) on the lowest setting, and take your time inspecting your results frequently.